Note: Screen Splitters Episode One was also Co-Operative Episode Two and incorrectly branded as that. You can find it here. Please Note: Many reviewers out there seem to think it is appropriate to discuss the events of previous episodes of Life is Strange as if everyone who would read it damn well should have already played the previous episodes. It has been my experience that if you have held out this long and haven’t already played this episode then you are most likely wondering how the game progresses throughout the season and will decide whether or not to buy when all episodes are out. This is why each episodic review is spoiler free for the entire season, not just this episode. We have arrived at episode 4, nearing the end of the season and who knows, perhaps this episode contains the major climax for the arc. I say this without assurance because episode 3 had such an unexpected cliffhanger that I didn’t think it was possible to get me again. I was wrong. That being said I need to come right out and say I was a little unimpressed overall with episode 4, proving that the warning I gave in the first episode’s review may have actually come to fruition. Whereas episodes 2 and especially three can begin to fork based off of your choices and possibly even suggest that two playthroughs is more of a recommendation rather than an option, episode 4 is forcing you down a corridor. Granted, it’s a well calculated corridor that presents itself with the illusion of choice, but I’ve seen this trick before in The Walking Dead series from Telltale and without sounding catty, I thought Dontnod was above that. There’s a decent amount of substance here still, with the story having easily its highest moment yet as the episode closes and again there are some strong emotional scenes that make up a very heavy episode. One thing I do find a bit troubling is the fact that as certain plots unfold, others are left almost unmentioned, which nets a lot of catch up, wrap up, and resolution required for the fifth and final episode. I’m just hoping that it remains as interactive as the others have been and doesn’t become the 90 minute ending of Metal Gear Solid 4. Dontnod has yet to convince me they don’t know how to craft a story and without a doubt they know how to catch my interest, here’s hoping the ending stands as strongly as the jaw-dropping cliffhangers of previous episodes. I was quite taken with my initial impressions of Life is Strange, the episodic game that’s part modern adventure and part Choose Your Own Adventure, but there’s a part of me that acknowledged many works have started with fantastic openings and fall short at the end. In fact, much of the first episode was probably how the game was pitched for development. Typically the second outing, especially in the case of episodic titles, give us a much better feeling of what the overall title is going to be like and allows us to gauge how effectively or ineffectively the unwinding story and gameplay goals are executing. It’s also important to note that almost universally the second episode is hit with the largest amount of criticism and negative feedback, if only because it’s a focused burst of reality on the high hopes of the first episode, but also because it’s an awkward in-between time for the plot. I wish I could say Life is Strange overcomes this potential hitch, but it does appear that like most of the others it just doesn’t quite pack the punch of the first. Adventure games have always been a bit of a split for me. I was never good at them, never completed many of them, and thus I wanted to write them off as worthless but what they did for storytelling is undeniable. TellTale somewhat switched up the definition of what goes into an adventure game, but try as they may I was hindered by either losing investment in the story or just not valuing these games any more than my current frustration with trying to beat Grim Fandango Remastered because I had never played before. I guess the biggest problem for me was the balance is never quite there. In a point-and-click adventure game there’s too much emphasis on puzzle solving and figuring out the developer whereas the TellTale games traditionally have too little and stand as nothing more than slightly interactive movies (that always seem to end in the same place regardless of those decisions). 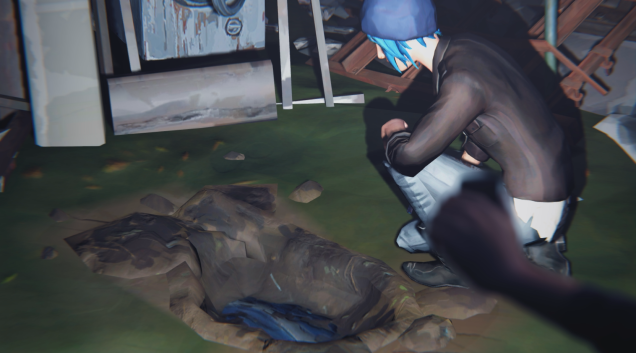 Life is Strange stands out because developer Dontnod (known previously for the great action title Remember Me) acknowledges the reality that you are a player interacting with an environment, but also allows you to relate to the person on screen so distinctly that you get the best of both worlds.